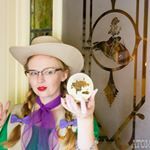 Dapper Day, the twice annually event that both well dressed folks and Disney lovers look forward to every year, was last weekend. Last fall Dapper Day I wore a western ensemble with slacks, and I enjoyed that so much I decided to go with a similar outfit, and as the weather was quite cool, Patrick finally wore a jacket and tie ensemble! And I actually managed to snap a couple pictures of him. Patrick’s jacket is honestly one of my favorite pieces in his wardrobe. And believe it or not, I thrifted it years ago! His whole outfit was a hit, and I’m pretty happy the man put the outfit together on his own! The wooden Disneyland inspired D brooch is a new gem from Match Accessories, who recently launched a Frontierland inspired collection. When I ordered this new D they made mine a little special, and swapped out a boot for the Smoke Tree Ranch brand. Smoke Tree Ranch was a beloved getaway spot for Walt Disney and his family. He loved the Palm Springs club so much that he regularly wore ties embroidered with the ranch’s brand. In fact the Partners statue in front of Sleeping Beauty’s Castle features the brand on Walt’s tie. Read more on Walt and Smoke Tree Ranch here. The only sad thing about this outfit, is that the hat is the same one I wore last fall Dapper Day, and as much as I would have loved to have worn a different one, I don’t actually own that many cowboy hats, mainly because I am extremely picky. Like this hat is absolute perfection, and I would love to own this exact hat in a variety of colors! The trials of vintage! You two look fabulous and Patrick is so cute and charming, the quintessential Dapper Dan! Both outfits are stunning and so is the setting..